- OLM to PST Converter Pro comes Backed with Free Premium Support. That is right, If you get stuck, Our Expert Techs are always Ready for rescue! So purchase with out worries! Need to Easily Transfer Mails from Outlook Mac 2011 (OLM Format) to Outlook Windows (PST Format)? With the change in technologies, one tends to change the computers and desktops that we make use of. While doing so, the major issue that everyone faces is Transferring mails from Outlook 2011 (OLM format) to Outlook Windows (PST format). With the lack of a better solution to revert back to Windows once they converted to Mac, users face many problems as Microsoft provides a one-way import option from PC to Mac but not the other way around. To be able to access the most direct and straight forward method to take ones mail from Microsoft Outlook 2011 (OLM format) to Outlook Windows (PST format), our developers came up with the most Advanced software in the form of OLM to PST Converter Pro. 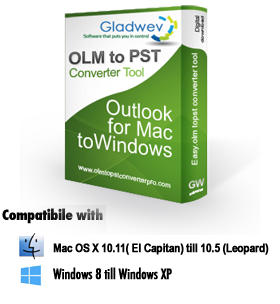 OLM to PST Converter Pro by Gladwev Software is known to deliver the most efficient and Straight-forward results when converting Outlook 2011 (OLM format) files to Outlook Windows (PST format) files, in comparison to any of its competitors. Although there are many manual methods available through which one can convert Outlook 2011 (OLM format) mails to Outlook Windows (PST format) mails, but all of them come accompanied with tons of errors and are very time consuming. OLM to PST Converter Pro is a completely automatic OLM to PST conversion software that will help you convert those OLM files to PST files without any troubles and that too within the shortest time period possible. The manual methods available come along a huge list of errors that are hard to tame which is another reason why when you require OLM to PST conversions with no error’s what so ever, so it is fair to say that OLM to PST Converter Pro should be your first preference. In case you decide to opt for the manual methods, you will not be able to preserve your mailbox hierarchy while converting the OLM files to PST format. When Mail hierarchy is of utmost preference to you, you should definitely make sure to go with OLM to PST Converter Pro. If data loss is a risk you are just not willing to take by using the manual methods of conversion, then OLM to PST Converter Pro is by far the best choice one has in the line of Third party conversion softwares. In case you get stuck anywhere in the process of converting those Outlook 2011 (OLM format) files to Outlook Windows (PST format files), you can rest peacefully with OLM to PST Converter Pro as our highly technical team of experts will get you through any problem in a matter of few seconds.